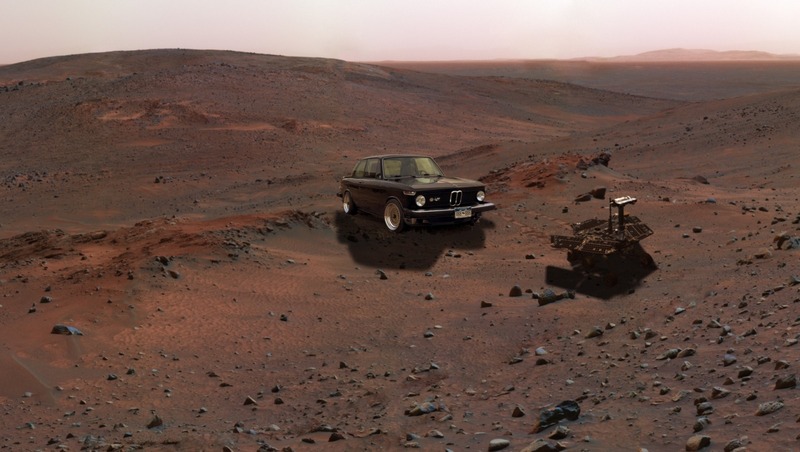 This image shows the celebrated Spirit Mars Exploration Rover next to a newly arrived Cosmosschwarz '76 BMW 2002 on the flank of "Husband Hill” inside Gusev Crater, located in the Columbia Hills region. This amazing image was produced using "Virtual Presence in Space" technology developed at NASA's Jet Propulsion Laboratory, Pasadena, Calif.
Three outcrops near each other on the flank of "Husband Hill" inside Gusev Crater are visible behind the 2002 on this false-color view taken on the FAQ 2002 team’s first martian day, or sol (February 1st, 2019). Spirit was launched June 10, 2003 UTC aboard a Delta II 7925 Launch Vehicle, and landed on the Red Planet January 4, 2004. Spirit, and Opportunity its identical twin, are robotic rovers that have gone far beyond their original scientic objectives to rewrite our understanding of the early history of Mars. NASA sent these two “robotic geologists” on a 90-day mission to search for geological clues regarding environmental conditions on early Mars, and assess whether those environments were conducive to life. Spirit’s final communication to Earth occurred on March 22, 2010, about six years into its mission. The rover lasted 20 times longer than its original design. Mineral springs once burbled up from the rocks of Columbia Hills. The discovery that hot springs flowed here was a major achievement of the Mars Exploration Rover, Spirit. The rover's discovery was an especially welcome surprise because Spirit had not found signs of water anywhere else in the 100-mile (160-kilometer)-wide Gusev Crater. After the Spirit rover stopped working in 2010, studies of its older data records showed evidence that past floods that may have formed a shallow lake in Gusev. Visiting Spirit has become a popular stop for the FAQ 2002 team.